Description: "Hey Sis, How's Mama?" 2 BNSF siblings pause at Bootlegger's Crossing. 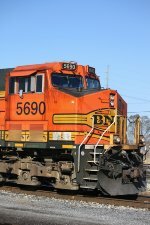 Description: BNSF 5690 stands in the setting sun at the West End of White Siding (NS Memphis Sub) as it awaits a meet with a loaded coal train. Description: A Scherer coal drag picks up speed in front of Fat Cats in Austell, GA....a good spot to eat and watch trains! Description: Heading into the yard with emptys. Description: Wide shot of a train of empties heading west toward Lincoln. Lines from Lincoln to Omaha and Plattsmouth (closest) are in the foreground. 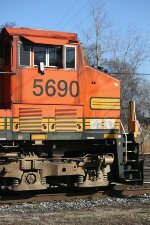 Description: BNSF ES44AC 5909 heads east along the Des Plaines River. Description: H-DILGAL heads for Galesburg this afternoon. Description: Close-up of power on a northbound manifest leaving Palmer Lake. Description: A fried GE is our DPU. Just too funny. Description: Empy coal train headed north leaving New Mexico. Description: DPU on 6207 northbound. Description: Just coming into view is this BNSF unit heading up an auto rack train and taking the turnout from the UP line onto the Indiana Harbor Belt mainline. Description: The BNSF train passes by the Indiana Harbor Belt tower sitting near the UP mainline at Dolton. Description: The burned side becomes more obvious on the BNSF unit. Must have been a good-sized fire!! Description: The cab looks streaked with road dirt (or diesel fuel) as it passes by. Description: The road dirt (or diesel fuel) is even more apparent on the cab side.